Buddhism puts an interesting spin on the afterlife. Since there’s no singular being or group of beings controlling your fate or judging your actions, your ultimate destiny boils down to karma. You’re in control based on what you do with your life. 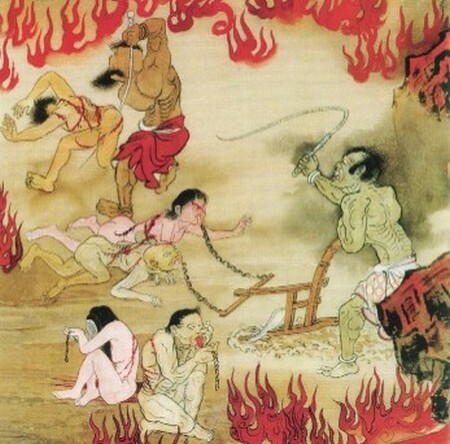 Naraka, the Buddhist equivalent to Hell, is broken into a series of different realms based on the severity of one’s bad karma. The worst is Avici. Avici is a massive cube structure buried deep beneath the ground. To get there one must have committed at least one of the Five Great Offenses (in a nutshell: murdering your parents or someone holy). One of the most unique aspects of Avici is that your time there is only temporary. Though it is a very long time (eons) and suffering is constant, once you’ve worked through your bad karma you’re reborn on a higher realm. However, you can die on Avici, though doing so just causes you to be reborn in Avici (what, you thought there was an easy way out of spiritual punishment?). Also unlike Hell, Avici isn’t seen strictly as some sort of spiritual punishment. Though you certainly don’t want to wake up there, it’s better viewed as a sort of spiritual cleansing. You may not have heard of Zoroastrianism before, but at one point it was one of the largest religions on the planet. 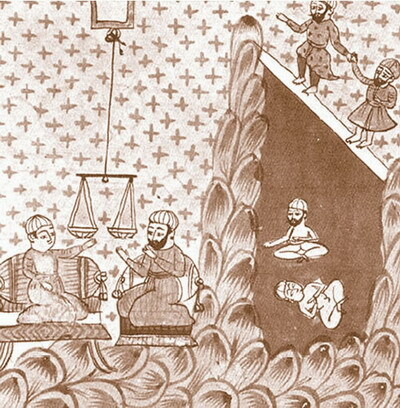 In Zoroastrianism there are two possibilities for your afterlife mirroring that of Heaven and Hell, but before you find either one you must cross the Chinvat Bridge, or the Bridge of Judgment. To those who lead a good life the bridge is easily passible, broadening as they progress and leading them to the House of Song to spend an eternity of peace. Sinners, however, must walk the bridge as it turns on its side and becomes narrow like a razor. Then a hideous woman appears to torment them until they fall off the bridge into the House of Lies. The House of Lies is something straight out of nightmares: those inside must eat rotten food (or flesh) and are continuously tormented while they do so. Also, despite being crowded to maximum capacity (apparently Zoroastrians didn’t have a good outlook for the bulk of us) each person trapped inside feels as though they are completely isolated. However, the House of Lies is similar to Avici in that it’s not the final resting place for the wicked. Eventually you’re granted entry to the House of Song, presumably after you fully understand just what a raging douche you were in life. Irkalla isn’t exactly a punishment so much as it is the end of the line. Folks don’t leave, there’s no lesson to be learned and nearly everyone but mythological heroes find themselves there, so it’s a bit of a downer. In Babylonian mythology, Irkalla was the world where the dead existed. One kept their body but it still decomposed. To get to your final destination you must travel through a series of seven gates first. You’re probably thinking “I’m not too keen on doing that or indeed, being in this terrible place,” and that’s all well and good, but you have no choice. There are guards posted at every gate to ensure that you follow the correct path and, just because, each one takes an article of clothing, jewelry or whatever possession you may have on your person when you die because hey, you’re dead. Things don’t exactly improve once you’re inside the final gate. Everyone is forced to consume only dust inside a massive dark expanse. There’s no Satan-esque figure to torture you or indeed, any actual punishment. You just kind of hang out and eat dust while you’re rotting. This, apparently, is supposed to be a parallel to the living world. We’re guessing the world was a vastly different place in the sixth century. 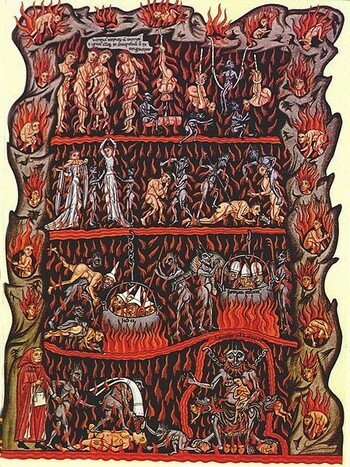 Jahannam is easily explained as the Qur’an equivalent to Hell, but it’s a little more complicated than that. Punishment is based on how one lived their life and only the most severe are kept in Jahannam for eternity. The most severe sin is the worshiping of multiple gods. A running theme in Jahannam’s punishments is “it’ll get better promptly before getting worse.” For example, one punishment is to have the skin of your body burned off, regenerated, and burned off again. Fire plays a pretty big role in things, from being dragged through fire, having to wear clothes made of flame, burning organs, the beat goes on. The person who is to be punished the least (since it’s all relative to the life you lead) will have their brain boiled from standing on hot coals. Think about that for a second: that’s the lucky guy. If you’re looking to customize your horrible otherworldly experience, simply commit suicide. The object you chose to end your life will torture you on the Day of Judgment and in Jagannam, though there’s a pretty solid chance it will also be on fire for the last bit. Diyu comes from Chinese mythology, the result of Buddhist beliefs mixing with different Chinese folk religions. 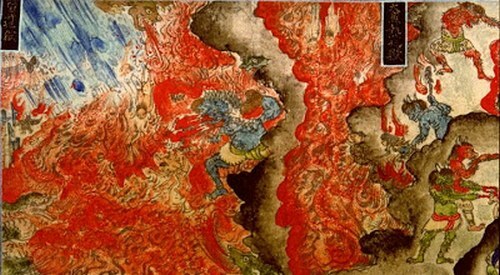 Diyu is similar to Nakara (mentioned in the first entry) in that it contains multiple hells, but in a nut shell Diyu is a massive underground maze held deep beneath the earth with different levels or chambers for each hell. Though specifics vary, most beliefs contend that Diyu is only temporary but everyone serves their time there with no exception. Thems the breaks, it seems. The chambers that contain each hell are guarded by a judge and contain oddly specific punishments. For example, the Mountain of Knives is exactly what you think it is. Sinners are forced to climb the mountain and destroy their own bodies in the process. The Grinding Machine is, again, exactly what it says on the label. There’s also the World of Ice where you are frozen and succumb to frostbite. Just in case you weren’t having a bad enough time being tortured, there’s a kicker: you can die again. Should you give it up to the spirit in the sky a second time you’ll simply be reborn in whatever hell killed you the first time. This happens an indefinite number of times until your soul is purified and you are reincarnated in a higher realm.